The report by Persistence Market Research on the global urinary catheter market provides an in-depth analysis and forecast on the market for the forecast period 2017-2021. The forecast period considered for the report is 2017-2021 and 2016 is taken as the base year for calculating all the market value and volume. Urinary catheters are used for patients suffering from urological disorders like urinary incontinence, retention, and others. 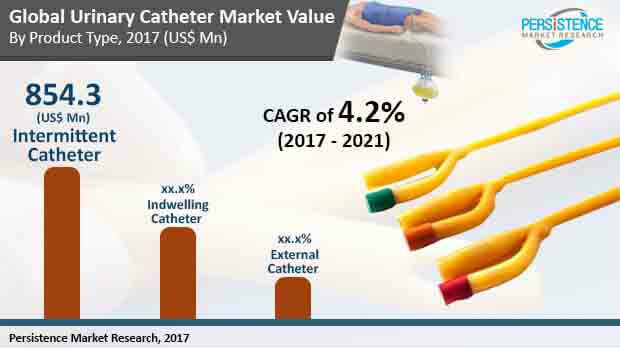 This report provides market insights, ongoing trends, driving factors and key opportunities in the global market for urinary catheter that are anticipated to benefit the manufacturers in the coming years. The report focuses on driving factors. Here, the report talks about the major factors that will play an important role towards the growth of the global urinary catheter market. The report also sheds light on all the vital factors that are likely to emerge as challenges in the global market for urinary catheter. Moreover, the report also provides information on the key trends and opportunities as the value-added feature. The report has also segmented the market into various segments, sub-segments and regions to provide easy and better understanding. Based on the segment-wise analysis, the report provides a detailed analysis of the major segments including product type and application. The report offers analysis of all the key segments and their sub-segments including volume and value for the forecast period in the global urinary catheter market. The region-wise analysis is also provided on the global market for urinary catheter. The key regions included in the report are Asia, Latin America, North America, Europe, and Rest of the World (RoW). Both value and volume are provided for historical, current and forecast period on all the regions and key countries in the aforementioned regions. This helps manufacturers’ to identify penetration of the market in various regions. The report on the global market for urinary catheter also provides detailed profiles of all the major companies operating in the market. The companies are evaluated on the basis of market share, financial and business overview, latest developments, and product portfolio. The report on the global urinary catheter market has been made by conducting both primary and secondary research. Financial and annual reports of the companies were taken into account as part of the research. Extensive interviews were conducted with subject matter experts. The opinions by respondents were also crosschecked with valid data sources. Furthermore, quantitative and qualitative inputs from experts were used to arrive at appropriate numbers. The forecast offered on the market consists expected revenue, CAGR, year-on-year growth in the global market for urinary catheter. The report offers in-depth analysis on the global urinary catheter market and the forecast on the revenue in terms of an absolute dollar opportunity. Absolute dollar opportunity is considered to be a major factor in identifying the key market opportunities for manufacturers. This also helps manufacturers to identify vital resources from a sales point of view in the global market for urinary catheter. A market attractiveness index is also provided in the report for overall understanding of the global urinary catheter market. The market for urology devices is witnessing a substantial growth in recent years, owing to the rise in urinary diseases and increasing awareness about the different types of devices used in urinary infections and diseases. A urinary catheter is used to drain out urine by inserting a catheter in patient’s bladder. A rise in the number of surgeries across the globe is resulting in the increasing demand for urinary catheters. Manufacturers are working on developing new products with special focus on patient’s comfort. Increasing popularity of home-based hemodialysis and fixer occluder devices are some of the latest trends in the global urinary catheter market. Major companies are also launching new products to hold their position in the global market for urinary catheter. These new product launches include the use of better materials that have biocompatibility. Silicone Foley catheter is preferred as it has longer life and minimizes the chances of irritation or infection. According to the report by Persistence Market Research (PMR), the global urinary catheter market is likely to see a moderate growth during 2017-2021. The global market for urinary catheter is estimated to reach US$ 1,755.0 Million revenue by 2021 end. Compared to various urinary catheter products, intermittent catheter is gaining a lot of traction in the market as intermittent catheterization is the primary choice as it is safe method. It has very few contraindications and allows normal bladder dynamics. Also the chances of developing infections, blockage and bladder spasms is reduced with intermittent catheter. Moreover, intermittent catheterization also reduces the risk urinary tract infection, improves possibility of renal recovery. The single-use intermittent catheter is most preferred for intermittent catheterization as it is convenient and also lower the risk of long and short-term complications. Prostate cancer is one of the leading causes of cancer death. In western countries, prostate cancer remains an important health concern, however, it is an emerging issue in developing nations. Prostate cancer is one of the most common cancers in the U.S. hence, the country has the most active prostate cancer detection programs in the world. This is leading to the rise in prostate gland surgery. Hence, the demand for urinary catheter is also increasing due to the growing number of prostate gland surgery performed worldwide. Urinary catheters are used after prostate gland surgery as it helps drain urine from bladder and also allows area to heal where prostate was removed. Companies are investing in the research and development activities to develop urinary catheter using biocompatible material. The use of silicone to develop urinary catheter is also increasing as it is insensitive to the changes in temperature and resistant to chemicals. Urinary catheters made using silicone also reduces the chances of meatitis, urethritis, and trigonitis. Most commonly used materials are latex and silicone. However, latex has been found to cause infections and reactions, hence, its use in developing urinary catheter has been reduced. Moreover, catheter made using silicone does not require to be changed frequently as compared to the latex ones. These players have been profiled on the basis of various attributes, such as company overview, recent developments, growth strategies, sustainability and financial overview.